After the city and the coast, there's nowhere else to go but the mountains. 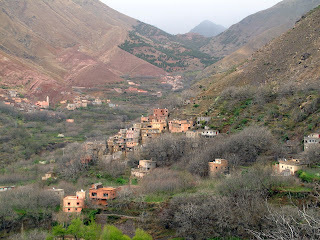 We made a long 6ish hour trip from the ocean to the High Atlas Mountains and the town of Imlil. The terrain went from barren, orange desert, to rolling hills with spots of green before being fully immersed in the mountains. Unfortunately the weather turned rainy and windy on our drive which thwarted some of our views, and made for a most interesting mule ride to our hotel. 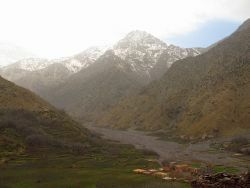 Vehicles have to drop their passengers in the tiny town of Imlil and then you need to hike or take the public transportation mules up the steep streets to your hotel. 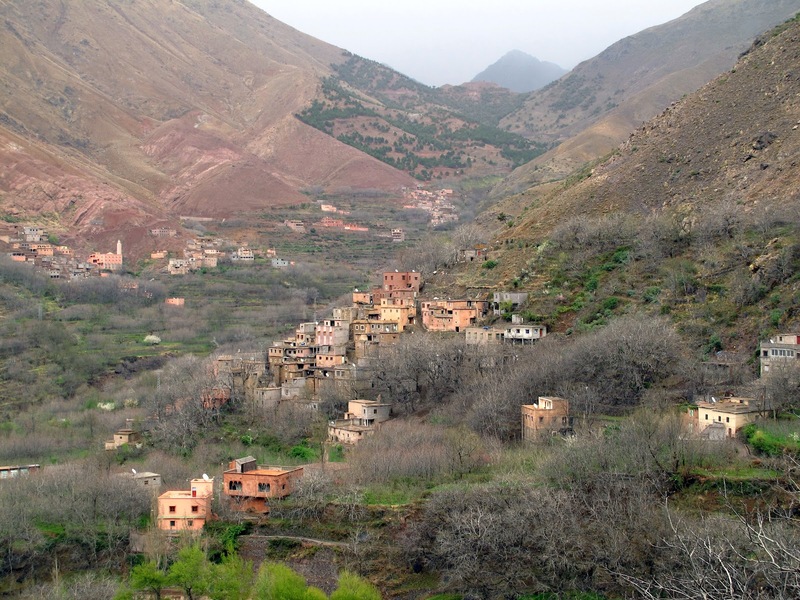 Seeing as I was in light beige linen pants with no rain gear with me, I wasn't sure there was a better or worse option for me, so I hopped on board the four legged creature and up we went the muddy hill until we reached our beautiful accommodation, Kasbah du Toubkal. My room was in the Tower, which was lovely, but my hair was a bit too wet to appropriately "let down my hair." The place had many nice touches including having a warm bottle/heating pad in your bed when you return from dinner. They also had many heavy sweaters and tunics to keep the chill out. Seeing as one of my favorite things about going to Japan was being able to wear a kimono robe to dinner, I seized the opportunity to be warmed head to toe. Luckily the next day, the sun came out, at least for a little bit, and a few of us took an amazing hike through the mountains and small villages. Snow capped mountains surrounded the valley. We walked through the peaceful, now dormant walnut grove. Once the first bloom occurs, young men can propose to their girlfriends, and then a huge Spring festival begins. The mountains were wonderful, and there was more amazing food, cooking, music and dancing. Details to come!